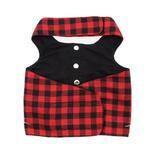 The Biker Vest Dog Harness by Doggles - Buffalo Plaid truly bad to the bone! Touch fastener closure and metal D-ring. 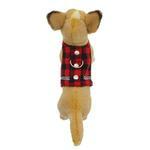 Show off your dog's bad-boy side with the Biker Vest Dog Harness by Doggles - Buffalo Plaid! 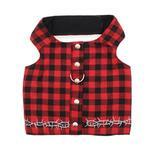 Ideal for the little dog that has a large "bad to the bone" attitude! The barb wire details gives this dog harness a dangerously cool look. Careful - this motorcycle dog vest stands out and demands attention. Not intended for the shy and timid dog! Whether they're tiny or huge, this dog biker vest will have them looking tough and feeling like a member of the gang (and possibly even the leader of the pack!) This dog biker harness is the perfect choice for heading up to Sturgis or hanging out at the local bike shop. Great for photo shoots and events. Look for our Doggles dog goggles and biker hat for a complete look. Fun for Halloween too! Biker Vest Dog Harness by Doggles - Buffalo Plaid Customer Photos - Send us your photo! I got my new Chihuahua, Pico this biker harness to match Paltrow's harness dress. They are both adorable. Thanks Baxter Boo! Posted On 07/27/17 by Lynda M from , WA Yes, Lynda M recommends this product! Such a nice match for the female version. Sized a tad large, but not enough to order a different size. Just a bit looser than usual. Posted On 12/28/16 by CML from , MI Yes, CML recommends this product! Really cute but seems to run large. Returned it and ordered a smaller size. I went by the measurements too. Posted On 12/12/16 by sarah f from , MA Yes, sarah f recommends this product! Cute on my male, and there's a matching female one as well! Posted On 10/14/16 by julia c from Bella Coola, Yes, julia c recommends this product! This item is very soft but yet strong. Fits to order and looks really cute and easy to put on. Posted On 10/05/16 by Lisa G from Lubbock, TX Yes, Lisa G recommends this product! I bought the smallest size which did fit but the measurements on the tag are different than the listing on the website. I would like to order the next size up so he can wear it as he grows but it is currently out of stock - hopefully will get more soon. Posted On 07/31/16 by Jane D from El Cajon, CA Yes, Jane D recommends this product! Doggles never fails to put out an excellent product! Really enjoy your site it is a place where i know i can find unique things for my josie girl.